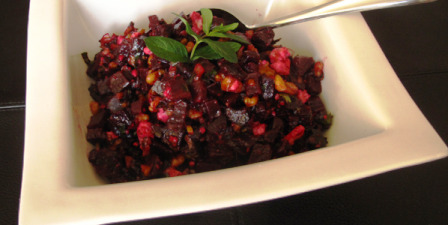 Consider adding the gorgeous beet to your meals to reap all the wonderful nutrients and beautiful flavor. This salad is wonderful and the walnuts are an added nutritional benefit. Enjoy! Whisk the butter with the cumin, garlic powder, paprika and cayenne. Toss the walnuts in the spiced butter. Place the walnuts on an aluminum foil lined baking sheet, in an individual layer. Place in oven and bake, shaking pan every 2 minutes, for about 6 to 7 minutes. Be very careful not to burn the nuts. Remove pan from oven and allow walnuts to cool down. Set aside. Wash beets. Place in a foil lined roasting pan and coat with olive oil. Place in oven and roast for 40 to 45 minutes, until cooked through. Remove from oven and allow cooling. In the meantime, make the vinaigrette. Place the 1/3 cup olive oil and vinegars in a bowl. Whisk. Add salt and pepper and whisk again. Toss in the vinaigrette and mix well. This delightful recipe brought to you by The Frugal Chef. Eat well without going broke!